I can get a sorted list of the sectors using the Sectors menu in the Channel bar. My question is, how can I view the stocks corresponding to the particular sector index within Trade Ideas? Is there a quick way that I can quickly check which stocks are hot .... or not! HI. 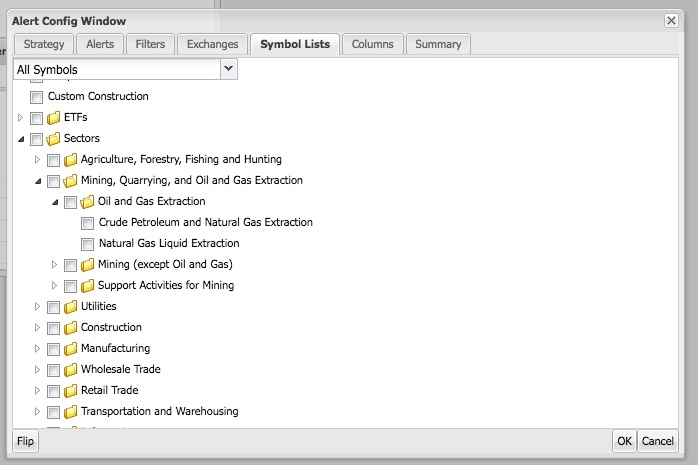 You can select the stocks within specific sectors by using the Symbol List tab in the configuration menu of any Top List or Alert Window within Trade Ideas. Take a look at the image above to see an example.